This report is in partnership with The Great Cities Institute and The Century Foundation’s Bernard L. Schwartz Rediscovering Government Initiative. This work was supported by a grant from The Joyce Foundation. In Chicago, 36.6 percent of young black men and 19.8 percent of young Latino men were out of work and out of school, compared to just 5.3 percent of young white men. Manufacturing jobs, many of them with few barriers to hire, could help ameliorate this employment inequity: there are two job openings in Chicago-area manufacturing for every worker being hired, and 16,000 unfilled openings in frontline production jobs that can be entered with only a high school degree. Chicago needs to ramp up its education and training efforts, starting in high school, in order to change young people's perspectives on the industry and offer them career-track opportunities. As recently as 2013, only 118 Chicago Public Schools students earned a manufacturing credential before graduating. But after its long period of job loss across the end of the twentieth century and the beginning of the twenty-first, the manufacturing sector has in recent years shown stability and potential for growth and reemergence. With that growth and potential in mind, this report explores manufacturing’s significance in the Chicago region and the sector’s potential to meet the needs of the unemployed, in particular unemployed black and Latino young people who have not received any post-high school education. Underpinning this analysis is the belief that Chicago’s disinvested communities deserve access to quality jobs with good wages, and that the manufacturing sector, through inclusion, has the potential to provide avenues to promote those goals. Building on a recent paradigm shift in analysis of these issues, wherein social inclusion is treated as multi-dimensional, dynamic, and multi-layered,1 this report makes a conceptual distinction between diversity, which considers the identity makeup of a group, and inclusion, which is the project of enabling individuals to participate and contribute fully to the group.2 Making the manufacturing workforce more diverse through the strategies in this report is only one component of true inclusion. First, we present a new analysis of job openings in the Chicago region, documenting the major level of opportunity in the region’s rebounding manufacturing sector.3 Not only does manufacturing have more openings than all but three other sectors (health care, professional services, and finance), there are two manufacturing job openings for every hire. The most immediate opportunity for inclusion come from the 16,000 unfilled openings in front-line production occupations that don’t typically require more than a high school degree as formal education (alongside work experience and technical training, depending on the job). Next, the report explores the current state of employment conditions in Chicago, which demonstrate high levels of economic inequality along racial/ethnic lines, thus illustrating the need to focus on economic inclusion. As an example of racial/ethnic disparities in economic opportunity for young people, in 2016, for twenty to twenty-four-year olds in Chicago, 36.6 percent of black males and 19.8 percent of Latino males were out of work and out of school, compared to just 5.3 percent of white males.4 This crisis represents an opportunity for the region’s manufacturing sector. Nearly one in three of its workers (30.5 percent) are over the age of fifty-five, and therefore desperately need to replenish its workforce as so many of its current employees retire. After that, the racial/ethnic makeup of the manufacturing sector is examined to measure the extent to which inclusion occurs in the industry, and underlying challenges that must be overcome in order to diversify it. This section finds that varying levels of employment in the manufacturing sector exist wherein Latinos represent 15.1 percent of the workforce, compared to 9.5 percent of whites and 6.5 percent of blacks. Not coincidentally, African Americans live the furthest from manufacturing workplaces; and beyond total industry representation, there are large differences in the occupations of each group within the industry: Latinos and blacks are most highly represented in lower-wage production occupations and whites in management and similar high-paying occupations. Lastly, to combat underrepresentation and occupational disparities within the industry, the report outlines some actions that would help manufacturers meet their needs for skilled workers while creating pathways to opportunities for more blacks and Latinos into well-paid manufacturing careers. As recently as 2013 (the most recent annual data available), only 118 Chicago Public School students in technical high schools attained an industry credential in manufacturing, demonstrating the urgent need to scale career education activities for the sector. The report will examine innovative education and training programs and how they might be rescaled to fit the Chicago region’s needs, as well as best practices developed in other regions that the Chicago region would do well to adopt. It concludes with an explanation about how education and training strategies will only succeed if they are part of an overall agenda to spur innovation and retain small manufacturers. In this moment in Chicago’s economic history, there is an opportunity to revitalize the region’s recovering manufacturing sector with a more inclusive future. The sector faces critical challenges attracting a new generation of workers that can adapt to the advanced manufacturing workplace increasingly characterized by robotics and automation. The region also has high rates of joblessness among blacks and Latinos, particularly those living in highly segregated and disinvested neighborhoods. With a commitment to expand opportunities for education and job training, the manufacturing sector and these communities of color can simultaneously address their respective employment needs. In the following sections, we present data and analysis from a variety of indicators to illustrate the state of manufacturing and employment in the Chicago region. As the analyses will show, histories of segregation and other forms of socioeconomic exclusion in the region have hit young people of color very hard when it comes to employment and income, in particular black and Latino people. At the same time, the manufacturing sector is suffering from a high ratio of job postings to hires. By taking a closer look at these phenomena, we will suggest bringing the needs of these communities and manufacturing industry together in a mutually beneficial way. Data on job openings reveal its capacity for new and potentially more diverse hiring. There has been significant debate about the shortage of skilled workers in Chicago manufacturing and the existence of a so-called skills gap.5 Rather than engage in the debate in this report, our interest was to examine the number of job openings advertised in the region. Manufacturing remains a larger and more vibrant source of employment opportunity than conventional wisdom may suggest. Our analysis of job openings data—using the best available data for the region: proprietary data on job openings prepared by Burning Glass Technologies6—reveals that manufacturing remains a larger and more vibrant source of employment opportunity than conventional wisdom may suggest. Moreover, despite major changes in the methods of production used in the industry, Chicagoans can enter the manufacturing field even when a high school degree represents their highest level of formal education. Job openings in the manufacturing sector in the Chicago region are the fourth highest among twenty industrial clusters. Figure 1 shows the top ten industries by the number of job postings in the Chicago region from April 1, 2017 to March 31, 2018. The manufacturing industry had 58,407 job postings, more than retail trade (55,422), transportation and warehousing (46,502), accommodation and food services (38,958), educational services (24,509), and twelve other industry groups. The three industries with more job postings than manufacturing were health care and social assistance (101,831), professional, scientific and technical services (66,837), and finance and insurance (61,864). How robust is the demand for workers in manufacturing when compared to other industries? Table 1 shows total employment, job postings, and ratio of openings to total employment for industries in the Chicago region in 2017. This ratio is often called the job opening rate, as it measures relative demand for new workers and can be compared across industries. Manufacturing has the eighth-highest ratio of openings to total employment out of twenty industries, ranking the sector clearly as a vibrant industry needing more workers to meet demand for products. Moreover, just three industries had a higher ratio and more job postings in 2017, meaning that even for its large size, the manufacturing industry still has large growth potential. Note: For comparison purposes, job posting data from calendar year 2017 is used for comparability across data sources, whereas other sections use April 1, 2017-to-March 31, 2018 job posting data to reflect most recently available data. Source: Quarterly Workforce Indicators (QWI), U.S. Census Bureau and Labor Insight Jobs (Burning Glass Technologies). To determine education and experience barriers to enter manufacturing industry jobs, we analyzed the levels of education and experience required for manufacturing industry job postings in the Chicago region from April 1, 2017 to March 31, 2018. Of the 58,407 job postings in the manufacturing industry, 17,420 did not specify required education and/or experience. Manufacturing industry job postings showed low barriers to entry overall in terms of both experience required and education levels needed. Entry-level employment, requiring zero to two years of experience, were high, with 4,821 postings specifying high school or vocational training as the highest education needed and 5,041 specifying a bachelor’s degree. In total, 7,655 postings required high school or vocational training as the highest level of education needed. Manufacturing in Chicago offers a range of occupational options. Broadly, these can be classified into front office occupations like management, sales, and engineering that more typically require a college degree, and front-line production occupations, like machine operators, welders, mechanics, and machinists that more typically require high school education and/or vocational training. In the section that follows, this front-line occupation grouping, termed as “manufacturing and production” occupations, will be explored further in depth as a potential inclusion catalyst for the Chicago region because of its relatively low skill and education barriers to entry. Manufacturing and production occupations had the second largest number of job postings from April 1, 2017 to March 31, 2018, with 7,321 postings within manufacturing, second only to business management and operations occupations, with 9,244 postings. Jobs in manufacturing and production occupations offer the possibility for immediate impact, given their attainable entry-level requirements. In the manufacturing industry, manufacturing and production occupations, as opposed to other occupations in the manufacturing industry, have more opportunities at lower education and skill requirements, making it an occupation with the potential for immediate employment with targeted efforts. This section will take an in-depth look at manufacturing and production occupations, their pay, and the education and skills required for employment. Figure 2 shows average yearly earnings for the top ten occupation groups by number of job postings in the Chicago region for jobs requiring a high school diploma or vocational training as the highest level of educational attainment from April 1, 2017 to March 31, 2018. Among these occupation groups, manufacturing and production occupations pay slightly above the group median. Job postings for manufacturing and production occupations advertised pay an average of $35,505, putting the grouping lower than just four others: maintenance, repair, and installation ($50,964), sales ($48,023), finance ($40,442), and health care, including nursing ($39,874). It should be noted that a significant share of maintenance and repair jobs are within factories, and even without factoring in that overlap, manufacturing and production occupations represent a significant target for immediate efforts to diversify manufacturing given their attainable entry-level requirements. While manufacturing jobs are competitive with other openings for workers with a high school degree or vocational training, the differences between these occupations in terms of pay is narrow. Discussions with local manufacturers indicate challenges they face hiring for factory jobs when service-oriented jobs may be more familiar and perceived as less demanding than manufacturing work, even while they pay similar wages.9 At earlier points in the industry’s history, the difficulty of manufacturing labor was one reason that manufacturing jobs historically paid a wage premium,10 with the other reason being a higher rate of unionization. But that high-wage hallmark has faltered, in part because of faltering union leverage, with less than 12 percent of manufacturing workers in the state of Illinois covered by a union contract, down from more than 22 percent in 1998.11 While that loss of leverage is lamentable, in the short term, the corresponding absence of a large premium has likely contributed to the industry’s high number of open entry-level jobs. Of course, manufacturers could take it upon themselves to raise wages to attract more workers. Figure 3 shows the levels of education and experience required for manufacturing and production occupation job postings in the Chicago region from April 1, 2017 to March 31, 2018. Of the 16,864 job postings for manufacturing and production occupations, 10,384 did not specify required education and/or experience. Of the postings that did specify education and experience requirements, high school or vocational training combined with zero to two years of experience had the most job postings, with 2,562. The next highest education and experience combinations were for a bachelor’s degree and three to five years of experience (1,488), and high school or vocational training and zero to two years of experience (1,009). Of all the job postings, 46.6 percent of them required zero to two years of experience and 48.1 percent required a high school or vocational training education. Figure 4 shows the most common skills required for manufacturing and production occupation job openings in the Chicago Region from April 1, 2017 to March 31, 2018. Of the 16,864 job postings, 3,016 of them did not have required skills and were not included in the figure. Of job postings with specified skills, the most frequent skills required can be classified as quality assurance and control (3,813), followed by packaging (2,245), machine operation (2,174), scheduling (2,058), repair (2,002), quality management (1,955), teamwork/collaboration (1,799), machinery (1,582), computer numerical control (CNC) (1,459), machining (1,309), and food safety (1,281). The definite impact of technology and the changing nature of production can be seen in this data. In factories where industrial robots and computer-controlled machine tools do much of the heavy lifting in production, front-line manufacturing jobs are changing. The most common skill today is quality assurance and control—which entails, in many cases, reviewing and monitoring what is produced through automated processes. Close behind it is repair, a job skill that will grow as the factory of the future includes more and more machines and automated labor. Similarly, the demand is growing for Computer Numerical Control skills: the technique for operating machine tools that create parts from raw materials using precise computer instructions. After suffering through a steep decline from 199812 to 2010, manufacturing employment has stabilized at 9.9 percent of jobs in the Chicago region, the third largest sector behind health care and retail.13 Despite its decline, manufacturing is a driver of the region’s economy and has opportunities for good-paying jobs. However, with a rapidly aging workforce, an influx of trained labor is needed to maintain its prominence and potentially grow. Stark underemployment among young African Americans and Latinos could receive some amelioration from the regional manufacturing sector’s need to replace these retiring employees, and to meet the needs of industry growth and expansion. In order to make these jobs inclusive of these black and Latino young people, the industry will need to make some significant shifts in terms of outreach and training, among other factors. The manufacturing sector pays better than the majority of the other sector groupings in the Chicago region. Figure 5 shows the average monthly earnings by industry in the region in the first quarter of 2017. Manufacturing had the eighth highest monthly earnings of twenty industry groupings, at $6,914. Earnings were more than twice as high as they were in four other industry groupings, including retail trade; agriculture, forestry, fishing and hunting; arts, entertainment, and recreation; and accommodation and food services. The average manufacturing production worker in the state of Illinois is older than the average worker in every other sector in the economy. Figure 6 shows employment by industry and age in the Chicago region in particular during 2017. Manufacturing has the smallest share of workers ages both fourteen to twenty-four and twenty-four to thirty-four, and subsequently the largest share of workers over age forty-five and, more specifically, the largest number of workers age fifty-five to sixty-four. This section will present economic indicators that illustrate racial/ethnic inequality in the Chicago region, highlighting some of the conditions that the project of economic inclusion aim to address. Defining characteristics of Chicago and the Chicago region are its high levels of racial/ethnic segregation and socioeconomic inequality. Chicago’s neighborhoods and areas across the region display disinvestment and uneven development that reflect this inequality. 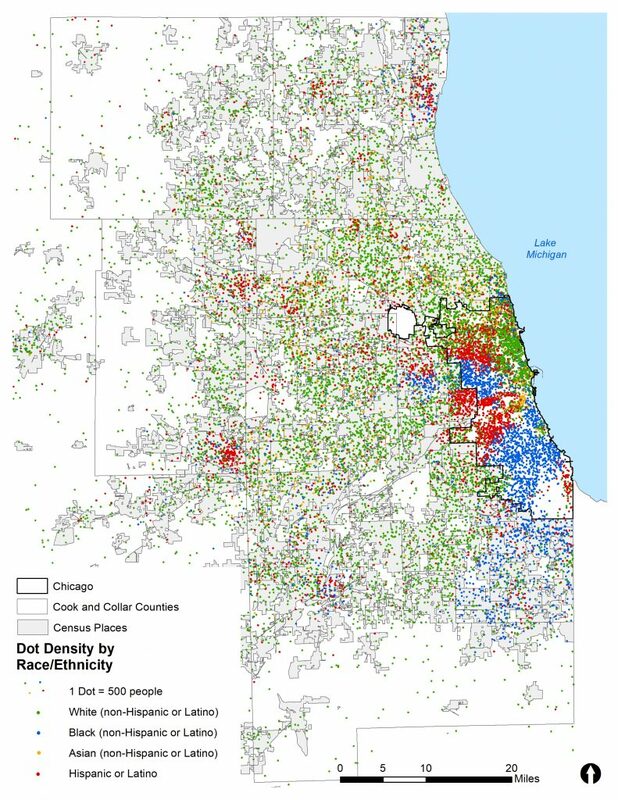 Map 1 shows Chicago and the Chicago region’s racial/ethnic segregation. In the figures and tables that follow, economic indicators reflecting racial/ethnic disparities in Chicago and the Chicago region are presented. Figure 7 shows the unemployment rate by race/ethnicity in Cook County and the greater Chicago region in 2016. The unemployment rate for black or African Americans in Cook County was 15.5 percent compared to 7.3 percent for Hispanic or Latinos and 4.0 percent for whites. In the Chicago region, figures are similar, with the unemployment rate for black or African Americans of 14.6 percent, 6.9 percent for Hispanic or Latinos, and 4.1 percent for whites. Figure 8 shows median household income by the race/ethnicity of the householder in Cook County and the greater Chicago region. The median household income for black-headed households was $36,477 in Cook County, lower than for Hispanic or Latino-headed households ($51,017), and less than half of white-headed households ($77,170). In the Chicago region as a whole, figures are similar, with the median household income of black-headed households of $37,666, $53,399 for Hispanic or Latino-headed households, and $81,303 for white-headed households. Substantial gaps exist in the proportion of racial/ethnic groups that are both not in school and not working (both out of school and out of work). The out-of-school and out-of-work population, often referred to as “disconnected” because of their disconnection from both formal education and employment, represent a population not advancing their future career prospects through education or gaining job experience. The out-of-school and out-of-work rate for black twenty to twenty-four-year-old males in Chicago was the highest among all racial groups at 36.6 percent, compared to just 5.3 percent for whites and a still-high rate of 19.8 percent for Hispanic or Latinos. Black males had higher out-of-school and out-of-work rates than did black females in all geographies, while Hispanic or Latino females in Chicago and greater Cook County fared worse than did males of the same demographic but were better off in Illinois as a whole and the United States as a whole. Chicago Cook County Illinois U.S. Chicago Cook County Illinois U.S. Source: 2016 American Community Survey, public use files. Tabulations by Great Cities Institute, University of Illinois at Chicago. This section examines the racial/ethnic composition of the Chicago region’s manufacturing industry, manufacturing occupations, and firm owners. Our analysis finds that manufacturing decline has had differing impacts on black, white, and Latino workers, stemming from each group’s different levels of employment in the industry and their different occupation concentrations. For instance, although Latinos have a larger share of their labor force working in manufacturing than do blacks and whites, firm management and ownership is disproportionately held by whites. Figure 9 shows manufacturing employment as a share of total employment by race/ethnicity in the Chicago region from 1994 to 2017. Each group experienced decline at faster rates from 1994 to 2010 and slower or stable rates from 2010 to 2017. For the total population, the percent employed in the manufacturing industry decreased from 17.9 percent in 1994 to 10.7 percent in 2010 and decreased 0.8 percentage points more from 2010 to 2017. 34.6 percent of Hispanic or Latino employment in 1994 was in the manufacturing industry, compared to just 15.7 percent of whites (non-Hispanic or Latino) and 6.5 percent of Black (non-Hispanic or Latino) employment. From 1994 to 2010, blacks and Latinos experienced relatively larger declines in manufacturing work as the proportion of black (non-Hispanic or Latino) workers in manufacturing decreased by 54.2 percent, for Hispanics by 49.1 percent, and Whites by 36.3 percent. Blacks and Latinos were hit the hardest by the major shrinkage of the region’s manufacturing sector in the period concluding with the end of the recession. From 2010 and 2017, the sector has turned around and employment has stabilized. However, this has had little impact on employment access to manufacturing jobs for the black population, as employment has remained flat at just 6.5 percent. Over the same period, the proportion of the white workforce decreased 0.8 percentage points from 10 percent to 9.2 percent, while Hispanic or Latino manufacturing employment decreased from 17.6 percent to 15.1 percent. The recent relative decline of manufacturing among Latino workers has not displaced them from their highest overall representation in manufacturing. Contemporary family and community connections into manufacturing, along with geographic factors, enables strong access and representation by Latino workers in the sector. Figure 10 shows employment by occupation in the manufacturing industry by race/ethnicity in the Chicago region in 2016. There were large differences in the occupations of black, white, and Hispanic or Latino manufacturing employees. 58.7 percent of Hispanic or Latinos working in manufacturing worked in production occupations compared to 49.6 percent of black workers in the sector, and just 23.4 percent of white workers. Hispanic or Latino and black workers were also more highly represented than white workers in transportation and material moving occupations. Hispanic or Latino and black manufacturing workers were far less represented in management, business, science, and arts occupations in the manufacturing industry than were white workers, with just 4.5 percent of Hispanic or Latino, 8.2 percent of black, and 22.1 percent of white workers working the same type of roles. These occupational differences result in vastly different pay scales and opportunities for career advancement. Our analysis finds that while manufacturing is higher-paying than all other sectors in aggregate, large differences in pay are still present. In Chicago region manufacturing, white workers have an $8,750 average monthly income compared to $4,763 for black workers and $3,963 for Hispanic or Latino workers. Comparing population size to firm ownership shows that black and Hispanic or Latino Illinoisans are underrepresented in firm ownership overall and to a greater extent in manufacturing firm ownership. Figure 11 shows total firm and manufacturing firm ownership with paid employees and population by race/ethnicity in Illinois in 2012. While the white (non-Hispanic or Latino) population was 62.9 percent of the population, 82.6 percent of manufacturing firm owners were white (non-Hispanic or Latino) while just 3.2 percent of manufacturing firm owners were Hispanic or Latino, despite being 16.3 percent of the total population; and 0.5 percent were black (non-Hispanic or Latino) despite being 14.2 percent of the population. Disparities in total firm ownership compared to population composition was similar although slightly lower for manufacturing firms. Map 1 shows population distribution by race/ethnicity in the Chicago region in 2012–2016. In Chicago, high levels of racial/ethnic segregation are present, with Chicago’s black population living on the South and West Sides of the city, Hispanic or Latinos living on the Southwest and Northwest Sides, and whites living on the North Side. Outside of Chicago, black residents are located primarily in the south suburbs of Chicago in Cook County and in Maywood and Bellville west of Chicago. There are many clusters of Hispanic or Latino residents present in the Chicago region outside of Chicago, with the largest areas with concentrations of Hispanic or Latino populations in Berwyn and Cicero just west of Chicago, Waukegan in Lake County, Aurora and Elgin mostly in Kane County, and Joliet in Will County. White residents are located throughout the Chicago region outside of Chicago but are less concentrated in areas with large populations of black and Hispanic or Latino residents such as the areas listed above. Maps 2 shows manufacturing jobs by Census-designated place and Chicago community area in the Chicago region. The city itself has 61,633 manufacturing jobs, and areas with over 4,000 manufacturing jobs include the Near West Side (4,695), New City (4,542), and South Deering (4,407). Other areas with large concentrations of manufacturing jobs outside the city are Elk Grove (13,414) in Cook County, Addison (6,397) in DuPage County, Elgin (7,723) in Kane County, Mundelein (5,046) in Lake County and Bolingbrook (3,196) in Will County. Overall, manufacturing is most concentrated in the northern and western suburbs of Chicago, with smaller clusters on the west side of the City of Chicago and its south suburbs. 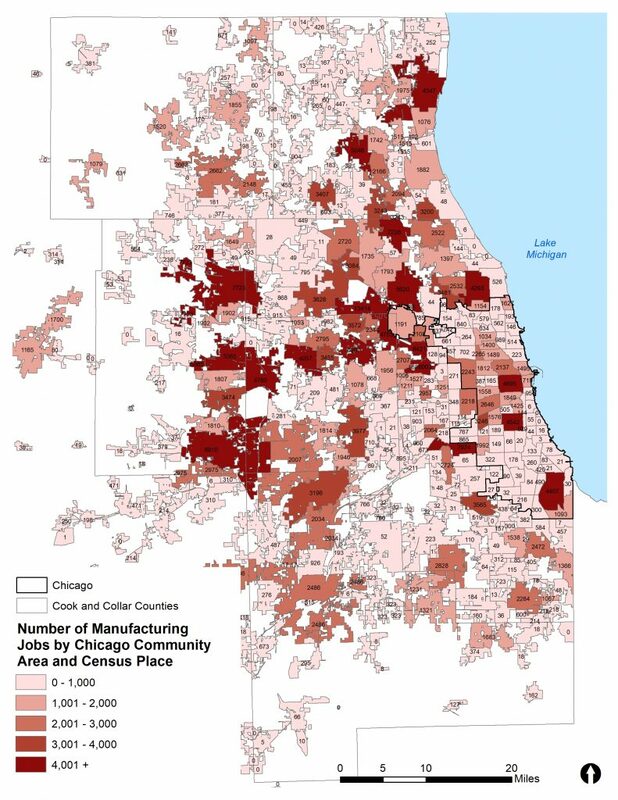 Latino communities have a significant presence in communities near these suburban manufacturing employment centers, for example in Waukegan, Elgin, and Aurora, which is a partial explanation for their high representation in the sector. White workers also live relatively close to manufacturing jobs in these suburbs, while African Americans live farthest. For example, neighborhoods on the South Side of Chicago and Chicago’s southern suburbs have the highest concentrations of African Americans in the region, and these communities are also the most deindustrialized. Taking public transportation to manufacturing jobs is not easy—most work is out of the central business district of municipalities across the region. This likely contributes to the chronic lack of inclusion of black workers in the sector. Source: 2012-2016 American Community Survey (ACS) 5-year Estimates, U.S. Census Bureau See Appendix 2 Maps 1 and 2 for Location of Census Places in Chicago Region and Chicago Community Areas. Source: 2015 Longitudinal Employment Household Dynamics (LEHD). See Appendix 2 Maps 1, 2 and 3 for Location of Counties and Census Places in Chicago Region and Chicago Community Areas. The data in the preceding sections paint a clear picture: manufacturing companies are hiring, and a significant share of their openings are within reach of Chicago residents with only a high school degree and limited work experience. These unfilled job openings represent a tremendous immediate opportunity to address the region’s stubborn levels of underemployment among black and Latino youth. With the current manufacturing labor pool being the oldest of any local sector, factory owners are showing a new openness to find the employees they need, and are likely to be willing to extend their hiring practices along the lines of diversity and thereby create a more inclusive workforce. Stimulate demand for manufacturing through public procurement and infrastructure projects. Creating a high-wage manufacturing economy in Chicago requires that all industrial policy is carried out with the needs of workers and communities at the forefront. In what follows, we will present our recommendations and best practices towards a more diverse and robust manufacturing sector in Chicago. Each section will include one or more model project or initiative worthy of close attention, and then a list of action items or important aspects of the section’s subject that must be considered if they’re to be successfully addressed. Programs in K–12 schools, technical schools, and community colleges that introduce young people to manufacturing in an inspiring and positive light are essential to connecting young Chicagoans to jobs in the sector. Through its Learn, Plan and Succeed Initiative, Chicago high schools have recognized the need for high school graduates to enter a job, a training program, or college.15 One significant obstacle to ensuring that all graduates can make that next step is that the number of vocational programs in Chicago has declined, dropping from 208 to 180 from 2012 to 2017.16 While manufacturing and pre-engineering are one of twelve industry clusters targeted by city’s career education programs, as recently as 2012–2013, only 118 students in the city received a manufacturing-related career certificate at one of these programs.17 The demand for skilled entry-level manufacturing workers is strong; the challenge is convincing young people to give these career paths a look and for the school system to train more students to make the most of the careers available to them in the sector. Chicago Public Schools (CPS) and other districts in the region can build on programs that already embrace these principles. One excellent model is Manufacturing Connect (MC). A program of Manufacturing Renaissance, MC operates a full-scale manufacturing training program at Austin College and Career Academy (ACCA), and two newer programs at Bowen and Prosser high schools.19 Manufacturing Connect’s broad goal is to provide education for the next generation of leaders in all aspects of manufacturing, including engineering, product development, production, business development, and ownership. MC’s program brings high-tech equipment to largely African-American neighborhoods and hires experienced teachers who teach courses that lead to nationally recognized industrial credentials. Moreover, the programs provide work experience in manufacturing with soft-skills training and personalized support and mentoring to help students adapt to unfamiliar work environments. Students completing manufacturing education programs should receive industry-recognized credentials like that from the National Institute of Metalworking Skills (NIMS) or the Manufacturing Skills Standards Council. Such credentials, which require challenging academic assessment of high-level high school skills, are especially important signals for small and medium manufacturers, who don’t have resources to train their own workers. Training on updated machining equipment such as computer-controlled machine tools (CNCs). Outdated equipment is a chronic challenge in career education. Computerized equipment has become the industry standard for design and production and has the bonus of being more interesting to young people. Training programs must make hands-on training with such equipment available to their students if they want to adequately prepare them for work in the sector. Instructor training: The shrinking number of career and technical education (CTE) programs has led to a shortage of trained instructors who can introduce and train students into manufacturing careers. The Chicago Teacher Union Foundation and Manufacturing Renaissance have started an instructor-apprenticeship program to begin the process of meeting this need. Youth apprenticeships: The most formal way for the K–12 system to prepare young people for manufacturing careers are youth apprenticeships, which combine work experience, mentorship at the job site, and skills training alongside critical instruction in math and reading.24 Wisconsin successfully uses youth apprenticeships to introduce and expose high school students to manufacturing work—with two levels of apprenticeship requiring 450 to 900 hours of work and four semesters of classroom training.25 Illinois has used a portion of its federal workforce grants to start up youth apprenticeships across the state, but program models differ significantly.26 Informed by the results of these pilot grants and continued leadership from groups like Young Invincibles, the state should adopt a more uniform definition of youth apprenticeship programs that receive public funding, with clearly defined workplace standards and protections, and give youth apprenticeships flexibility when it comes to graduation requirements like days in school. One such model already in practice in Chicago is sectoral partnerships. Sectoral partnerships bring together multiple employers, labor unions and training providers within an industrial cluster to address the workforce needs of employers and provide workers with pathways to high-value, family-sustaining jobs.29 Because they focus on the needs of whole industries rather than those of single employers, sectoral partnerships realize economies of scale in providing effective training and certification for multiple employers in an area. They have allowed training providers to establish deep bonds with local manufacturing companies facilitating the placement of more minorities and women into manufacturing. OAI, Inc. and its partners are making manufacturing more inclusive through integrated workforce, economic development, and educational programs in the southern part of the Chicago region. The Calumet Green Manufacturing Partnership initiative has helped over 350 people earn high-demand manufacturing-related credentials, including NIMS, MSSC, and American Welding Society (AWS) at area colleges, followed by employment placement, since 2011. Additionally, since 2014, over 142 opportunity youth have been placed into paid internships following a four-week job readiness bootcamp, 90 percent of whom were black or Latino. Recognizing the need for a more human approach to human resources, OAI offers the fee-for-service Retention Plus program, which helps employees navigate the public and private resources available to address a wide range of work/life challenges, such as childcare, transportation, finances, housing, and health. OAI and the Chicago Southland Economic Development Corporation sponsor the Southworks Robotics and Engineering Olympics to expose kids of color to high-tech industrial careers and introduce manufacturers to local talent. Building on its successes, OAI and its partners launched the Calumet Manufacturing Industry Sector Partnership (CMISP), a network of over forty metal, machinery, and equipment (MME) manufacturing businesses in the Calumet area. Industry leaders hope to address three priorities for action: developing a skilled workforce, increasing business-to-business networking, and improving infrastructure. Intermediaries for establishing and recruiting into manufacturing apprenticeships and training programs: Organizations like the Chicago Federation of Labor (CFL) are seeking to coordinate access to apprenticeships and other skills programs with industry-recognized credentials. The CFL is seeking to make the critical step of creating a single point of contact for interested community members to navigate the different possible process into apprenticeships in existing construction, transportation, and manufacturing trades. CFL is working to partially replicate the Milwaukee-based Wisconsin Regional Training Partnership (WRTP/BIG STEP), which coordinates employer-driven worker readiness efforts and skills training, targeting good-paying jobs in key sectors, such as manufacturing and construction.34 WRTP has established a reliable training path into manufacturing for community residents, displaced workers, and youth coming out of K–12 education, investing in ongoing outreach, orientation, and assessment. Prioritize outreach to diverse communities: A steady flow of potential workers of color into sectoral programs is a prerequisite to a more diverse sector, requiring ongoing outreach and coalition building with business, public education, and community-based organizations. One stand-out organization in the region is Toward Employment, based in Cleveland, whose WorkAdvance programs created rigorously tested employment gains, including for workers with criminal histories.38 Toward Employment emphasizes the need to work with community-based organizations that offer “high touch” recruitment for people with low incomes, criminal records, and other barriers to employment and economic mobility. Because of its high pay and unique contributions to economic growth and innovation, manufacturing is a heavy recipient of government subsidies. Illinois is no exception, with programs like the EDGE tax credit bringing significant support to the sector. Illinois has taken major steps to track the impact of economic development subsidies on employment, training, and wages, and now ranks number one on the Good Jobs First subsidy tracking report card.52 The other major subsidy for manufacturing is public procurement, as government purchasing billions of dollars in manufacturing goods can support local manufacturing job creation. When it comes to public transit, Chicago has made major strides using a new policy—the U.S. Employment Plan—that allows government to give extra points to bidders who produce and hire locally.53 The Plan was used in a recent bid for a $1.6 billion project. CRRC Sifang America won the bid to build a railcar manufacturing facility that will produce 800+ next-generation 7000-series railcars, facilitating the manufacturing of Chicago Transit Authority (CTA) railcars in Chicago for the first time in over fifty years.54 When CRRC won this project, they signed onto a community benefits agreement, which was designed by Jobs to Move America (JMA) and a broad coalition of community and labor groups. The agreement ensured CRRC would meet regularly with the coalition to ensure employment promises are met, including that all employees receive training and pre-apprenticeship experiences offered by the group. The project represents CTA’s capacity to deepen economic opportunity in Chicago through its manufacturing supply chain, and when the facility is complete, will employ 200 new employees. Illinois should build on its track record of subsidy accountability. To the extent possible under the law, standards should apply not just for jobs and wages, but for inclusion by race, gender, and geography. Agencies cannot require hiring based on race or gender, but can certainly request such information. Furthermore, Illinois should aggressively enforce clawbacks or penalties for non-compliance when companies fail to live up to their job creation promises. With future high-budget transportation projects (greater than $500,000), regional governments should use the U.S. Employment Plan, or some adaptation of it should be included in requests for proposals for procurement projects. This report shows that while manufacturing had a steady period of decline from the mid-1990s to 2010, there has been stability in the industry since then, and it continues to be a large part of the Chicago region’s economy. Examining job postings in the manufacturing sector shows that barriers to entry are lower compared to other occupations due to fewer years of experience and lower levels of education necessary for employment. These occupations have the potential to make more immediate impacts for those who are economically disadvantaged than do industries that require many years of experience and higher levels of education. While pay is not as high as those indicated in other industries’ job openings, the earnings levels are nonetheless higher than the households of many in the region. As this report lays out, through a proper set of industrial policies and sound educational practices, manufacturing holds strong promise for establishing good-paying jobs for young black and Latino workers, and, in return for that inclusion, the sector will receive the workforce replenishment it needs to overcome the aging-out of many of its current employees. The authors appreciate the research support of Amanda Novello and helpful comments and information from Joel Yudken, Greg Leroy, Carrie Thomas, Erin Steva, Guy Loudon, Thomas Day, Erica Swinney-Staley, and Mollie Dowling. This work was supported by a grant from The Joyce Foundation. Download appendices 1 and 2 here. Peter Huxley et al, “Development of a social inclusion index to capture subjective and objective domains (Phase I), Final report to NCCRM,” National Coordinating Centre for Research Methodology, United Kingdom, 2006 5–6, http://citeseerx.ist.psu.edu/viewdoc/download?doi=10.1.1.469.5761&rep=rep1&type=pdf. Mark G. Friedman, Ruthie-Marie Beckwith, and James Conroy, “Inclusion Is Transformative: Self-Advocacy Leaders’ Perspectives on Board Inclusion and Tokenism.” Inclusion, September 2016, 4(3), 183-190, http://www.aaiddjournals.org/doi/abs/10.1352/2326-6988-4.3.183?code=aamr-site. For the purposes of the report, the Chicago region is defined as Chicago, Cook County, and Cook County’s collar counties: Lake, McHenry, Kane, DuPage, and Will. Teresa Córdova and Matthew Wilson, “Industrial Restructuring and the Continuing Impact on Youth Employment in Illinois,” Great Cities Institute, University of Illinois at Chicago, May, 2018, https://greatcities.uic.edu/wp-content/uploads/2018/05/Industrial-Restructuring-v1.3.pdf. http://www.cmap.illinois.gov/updates/all/-/asset_publisher/UIMfSLnFfMB6/content/searching-for-evidence-of-a-skills-gap-in-manufacturing; Alison Dickson Quesada, Frank Manzo, and Robert Brunon, “A Manufactured Myth:Why Claims of a ‘Skills Gap’ in Illinois Manufacturing are Wrong,” LEP Briefing Paper, University of Illinois at Urbana-Champaign, https://ler.illinois.edu/wp-content/uploads/2015/01/LEP-Briefing-Paper-Skills-Gap_-Dickson-Manzo-Bruno.pdf. Burning Glass Technologies compiles data from internet-based job postings from more than 40,000 sources and tracks nearly 3.4 million postings at any given time. For more information about Burning Glass Technologies data collection, classifications, and methods, see https://www.burning-glass.com/about/faq/. The ratio of job postings to hires are subject to multiple interpretations. There are any number of reasons why ratios may be high or low. A high ratio of postings to hires could signify an unwillingness to work in an industry because of factors including (but not limited to) low pay, limited advancement potential, stigmatization of occupation, or locational job–worker spatial mismatch. A high ratio could also signify a skills shortage, meaning that the workforce is not equipped to fulfill vacancies because of a lack of skills, training, or education. Job posting practices can also lead to high ratios, such as when an employer continuously advertises a posting even when they are not actively seeking anyone for hire. Low ratios can signify that industries use online job postings less than other forms of job advertisement, such as storefront advertising, using recruiting agencies, or other forms of hiring practices. “Searching for Evidence of A Skills Gap,” Chicago Metropolitan Agency for Planning, March, 2015, http://www.cmap.illinois.gov/updates/all/-/asset_publisher/UIMfSLnFfMB6/content/searching-for-evidence-of-a-skills-gap-in-manufacturing. Interview by Andrew Stettner with local manufacturing leaders on March 19, 2018. “Union Membership and Coverage Database from the CPS,” Unionstats.com, January 21, 2018, www.unionstats.com. Manufacturing employment declined before the mid-1990s but was not included in this report due to the primary employment data source, which had the most accurate current data for the purpose of this report but did not have longitudinal data available for the Chicago region. “Quarterly Workforce Indicators,” 2012 Q3 through 2017 Q1, QWI Explorer, U.S. Census Bureau, accessed May 7, 2018, https://qwiexplorer.ces.census.gov/static/explore.html#x=0&g=0. Joel Yudken, Tom Croft, and Andrew Stettner, “Revitalizing America’s Manufacturing Communities,” The Century Foundation, October, 2017, https://tcf.org/content/report/revitalizing-americas-manufacturing-communities/. Chicago Public Schools, “Announcing Learn, Plan, Succeed,” Inside CPS Blog, April 5, 2017, https://blog.cps.edu/2017/04/05/announcing-learn-plan-succeed/. “A City That Works: CTU Recommendations to Improve Post-Secondary Outcomes for Students,” Chicago Teacher Union Foundation, May 7, 2018, https://www.ctunet.com/research/a-city-that-works. Rebecca Harris, “Ticket to a Job,” Catalyst In Depth, Community Renewal Society, Winter, 2014, http://www.chicagoreporter.com/wp-content/uploads/assets/20140206/catalystindepth-winter2014f.pdf. Nancy Hoffman, “10 Equity Questions to Ask about Career and Technical Education,” Jobs for the Future, February 13, 2018, http://www.jff.org/blog/2018/02/13/10-equity-questions-ask-about-career-and-technical-education. Manufacturing Renaissance, “Manufacturing Connect,” accessed May 19, 2018 https://www.mfgren.org/manufacturing-connect. Joel Yudken, Tom Croft and Andrew Stettner, “Revitalizing America’s Manufacturing Communities,” The Century Foundation, October, 2017, https://tcf.org/content/report/revitalizing-americas-manufacturing-communities/. Nancy Hoffman and Bob Schwartz, Learning for Careers: the Pathways to Prosperity Network (Cambridge, MA: Harvard Education Press, 2017), https://www.jff.org/resources/learning-careers-pathways-prosperity-network/. “Connecting Activities,” Massachusetts Department of Elementary and Secondary Education, accessed May 15, 2018, http://www.doe.mass.edu/connect/. Erin Steva, “Making Youth Apprenticeships Work for Illinois’ Young Adults,” Young Invincibles, July, 2017, http://younginvincibles.org/wp-content/uploads/2017/07/YI-Apprenticeships-Report_final.pdf. “Wisconsin Youth Apprenticeship Program Operations Manual,” Wisconsin Department of Workforce Development, accessed May 19, 2918, https://dwd.wisconsin.gov/youthapprenticeship/pdf/program_operations_manual_2015.pdf. “2017 Apprenticeship Plus Youth Program, “ Illinois Department of Commerce, April, 2017, https://www.illinoisworknet.com/youthnofo. “Registered Apprenticeship National Results,” U.S. Department of Labor, accessed May 19, 2018, https://doleta.gov/oa/data_statistics.cfm. Illinois Department of Commerce and Economic Opportunity, “Apprenticeship: A Strategy to a Career Pathway,” https://www.illinoisworknet.com/apprenticeshipplus accessed May 22, 2018. Sarah Odmixon, “State Sector Strategies: Regional Solutions to Worker and Employer Needs,” NGA Center for Best Practices, November 9, 2006 http://www.sectorstrategies.org/sites/all/files/State%20Sector%20Strategies%20Brief.pdf. Jason A. Tyszko, “Replicating Success at the Jane Addams Resource Corporation: Scaling Training and Employment Services Through Community-Based Nonprofits,” American Enterprise Institute, April 2018 https://www.aei.org/publication/replicating-success-at-the-jane-addams-resource-corporation-scaling-training-and-employment-services-through-community-based-nonprofits/. Molly Giesen-Fields, Lindsay A. Hoffman, Vera A. Moore and Linda M. Rodríguez, “Service Integration: Delivering Economic Strengthening Services to Low Wage Workers,” 2010 http://seedco.org/wp-content/uploads/2011/11/Service-Integration-Delivering-Economic-Strengthening.pdf. Interview with Guy Loudon by Andrew Stettner, May 10, 2018. Melissa MacGregor and Heather L. Fox, “Registered Apprenticeships: Integrated Earn and Learn Pathways at Harper College,” Illinois Office of Community College Research and Leadership, June, 2017, https://occrl.illinois.edu/docs/librariesProvider4/cte-apprenticeships/registered-apprenticeships.pdf. “History,” Wisconsin Regional Training Partnership (WRTP/BIG STEP), accessed May 19, 2018, http://www.wrtp.org/history/. “Growing Skills for a Growing Chicago,” J.P. Morgan Chase, June, 2015, https://www.jpmorganchase.com/corporate/Corporate-Responsibility/document/54841-jpmc-gap-chicago-aw3-v2-accessible.pdf. “Chicago Metro Metal Consortium Manufacturing Community,” Investing in Manufacturing Communities Partnership, accessed May 25, 2018, 9, https://www.eda.gov/files/imcp/1st-round/IMCP-2-Pager-Handout-Chicago.pdf. “Technical Opportunities Program (TOP),” Chicago Women in Trades, accessed May 22, 2018, http://chicagowomenintrades2.org/programs-2/technical-opportunities-program/. “WorkAdvance Northeast Ohio,” Towards Employment, accessed May 25, 2018, http://towardsemployment.org/strategic-initiatives/workadvance/. “Support HB 3177 / SB 1614,” Chicago Jobs Council, https://cjc.net/wp-content/uploads/2017/07/Bill-One-Pager_v12.pdf accessed May 18, 2018. U.S. Department of Labor Employment Training Administration Office of Apprenticeship, “Learn About Tax Credits,” https://doleta.gov/oa/taxcredits.cfm accessed on May 19, 2018. New York Department of Taxation and Finance, “Empire State Apprenticeship Tax Credit,” https://www.tax.ny.gov/pit/credits/empire-state-apprenticeship-tax-credit.htm accessed May 21, 2018. Defined as less than 500 employees. Dan Swinney, “The Chicago Ownership Conversion Project: Transition to Transformation,” Manufacturing Renaissance, December 10, 2017. U.S. Department of Labor, “WIOA Final Regulations,” Federal Register 81, (August 19, 2016): 55791 https://www.federalregister.gov/documents/2016/08/19/2016-15977/workforce-innovation-and-opportunity-act-joint-rule-for-unified-and-combined-state-plans-performance. Joel Yudken, Tom Croft and Andrew Stettner, “Revitalizing America’s Manufacturing Communities,” The Century Foundation, October 2017 https://tcf.org/content/report/revitalizing-americas-manufacturing-communities/. Illinois Department of Commerce and Economic Opportunity, “SFY ’15 Annual Report,” https://www.illinois.gov/dceo/AboutDCEO/ReportsRequiredByStatute/SFY15%20Annual%20Report%20Final.pdf. Ohio Employee Ownership Center, “The Power of Employee Ownership,” http://www.oeockent.org/wp-content/uploads/2013/05/OEOCFourPagerWeb.pdf accessed May 19, 2018. Thomas Day “Invent 2026: A technology for us,” Illinois Applied Research Institute, October 2016 https://docs.wixstatic.com/ugd/27020c_5f9daf982757472c99aae562f57aa3ce.pdf. Andrew Stettner, “How the Federal Government Can Foster Stateside Advanced Manufacturing,” The Century Foundation, April 2018 https://tcf.org/content/report/federal-government-can-foster-stateside-advanced-manufacturing/. Philip Mattera, Thomas Cafcas, Leigh McIlvaine, Kasia Tarczynska, Elizabeth Bird and Greg LeRoy, “Show us the Subsidized Jobs,” Good Jobs First, January 2014 https://www.goodjobsfirst.org/showusthesubsidizedjobs. Madeline Janis, Roxana Aslan and Katherine Hoff, “Harnessing Government Spending to Revitalize Good Manufacturing Jobs,” The Century Foundation October 2017 https://tcf.org/content/report/harnessing-government-spending-revitalize-good-manufacturing-jobs/. Carolyn Shropshire, “First Step to New CTA rail cars: Build the factory in Chicago,” Chicago Tribune, March 16, 2017 http://www.chicagotribune.com/business/ct-cta-new-railcar-plant-0316-biz-20170315-story.html. Teresa Córdova, Ph.D. is the Director of the Great Cities Institute (GCI) and Professor of Urban Planning and Policy at the University of Illinois at Chicago. Córdova has been an elected and appointed member and/or chair of national, regional and local boards and government commissions and advisory boards, and has received multiple national awards including Sor Juana Legacy Award from the National Museum of Mexican Art. As Director of the Great Cities Institute at the University of Illinois at Chicago, Teresa applies her years of experience and commitment towards addressing challenges facing cities and regions, while simultaneously advancing UIC's Great Cities Commitment. As an applied theorist, political economist, and community-based planner, Professor Córdova approaches her work as a scholarship of engagement in which research, pedagogy and service are integrated. Matthew Wilson, MUPP, is an Economic Development Planner at the Great Cities Institute at University of Illinois at Chicago. He primarily works within its Neighborhoods Initiative, where he collaborates with community-based organizations, university faculty, and staff to provide technical assistance and services for community and economic development projects. He holds a BA in Urban and Public Affairs (2012) and a Master of Urban Planning and Policy (2014), both from University of Illinois at Chicago.